On the balcony of my suite aboard AmaLea, the scene is the inspiration to write a waltz. The ultra-green rolling hills on the banks of the Danube frame views of Baroque steeples in fairytale towns. Kids smile and wave as we sail close to the stony shores where swans bob in the swift-moving current. Our journey on AmaWaterway’s newest river cruiser is a classic: The Danube from imperial Budapest, with adventures in beautiful Bratislava, graceful Vienna and charming picturesque towns in the wine district of Austria and Germany that inspired generations of artists and musicians. The elegant new AmaLea is an inspiration as well. Her spacious yacht-like suites are rich with polished woodwork and the opulent fabrics you might pick for your home if you had an unlimited budget. Counters in the dressing area and bathroom are topped with chocolatey marble. Adding to the mood are decadent art nouveau Gustav Klimt prints on the walls and in the hallways. If it all feels like a visit to a fine family home, there’s good reason. 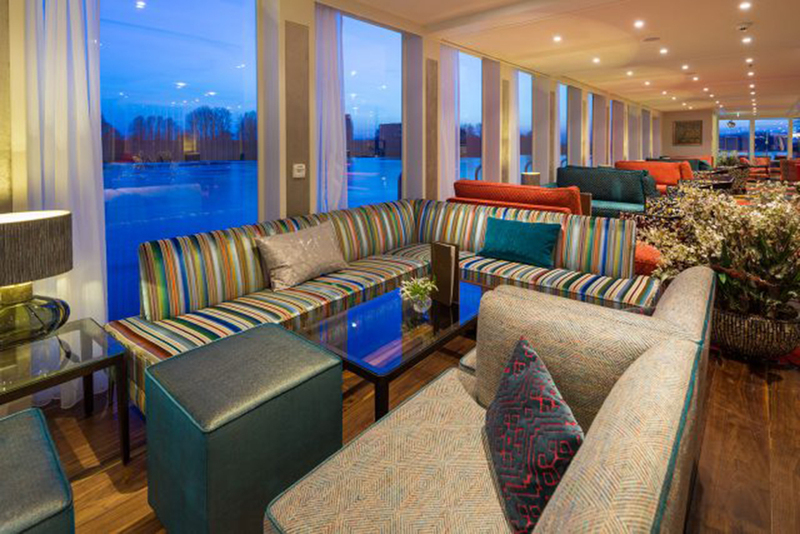 While some other river cruise lines build ships in volume, AmaWaterways fits out only one or two new ships a year to make a more personal statement. Two of the co-owners, president Rudi Schreiner and executive vice-president Kristin Karst, personally select the colours and fabrics for their ships to make each one unique. AmaLea is more than just a sister to AmaWaterways’ growing fleet, because she also showcases the latest in technology and personal luxury. There’s an ingenious digital ambience control on the wall that lets you adjust climate and lighting--from daylight to “romance”—with a touch of a finger. The interactive televisions are from Apple and there’s dependable Wi-Fi everywhere on the ship. I was really impressed that even when we’re going through a lock on the river, usually a dead zone for internet, the signal strength remained strong. Even though Rudi says providing dependable complimentary internet now costs as much as fuel on AmaLea, he’s found the investment in signal strength is worth it to help the tech-savvy guests that AmaWaterways attracts stay in touch with home and business while they’re on a cruise. 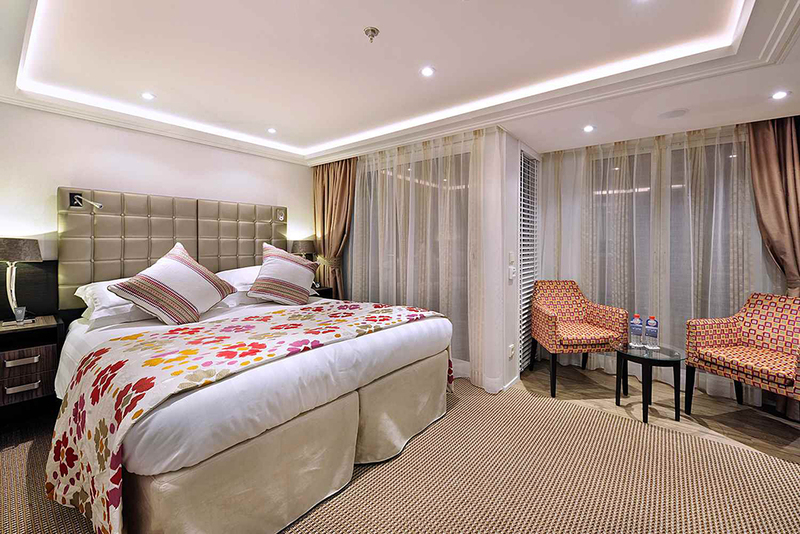 Most of the suites on AmaLea feature innovative twin balconies that have become an AmaWaterways signature. Half of the floor-to-ceiling windows along the outer wall open to a full outdoor balcony and the other half of the panorama is a sitting area that adds interior space to the suite with a Juliet-style window that lowers with the flick of a switch. Now it’s time to explore ashore. A typical morning features a choice of complimentary guided tours. On one memorable stop in the charming Austrian town of Weissenkirchen, guests were offered the choice of spending the morning riding the ship’s fleet of trail bikes along the shore or taking bus tours to nearby historic Durnstein or Melk Abbey. An appealing option was to stay on board for a leisurely sail and watch the fascinating passing scene from the lounge or the top deck that features a small pool with a swim-up bar. It’s interesting how even though river ships have become common everywhere in Europe, people on shore still line the banks of the Danube to watch the AmaLea sail past. 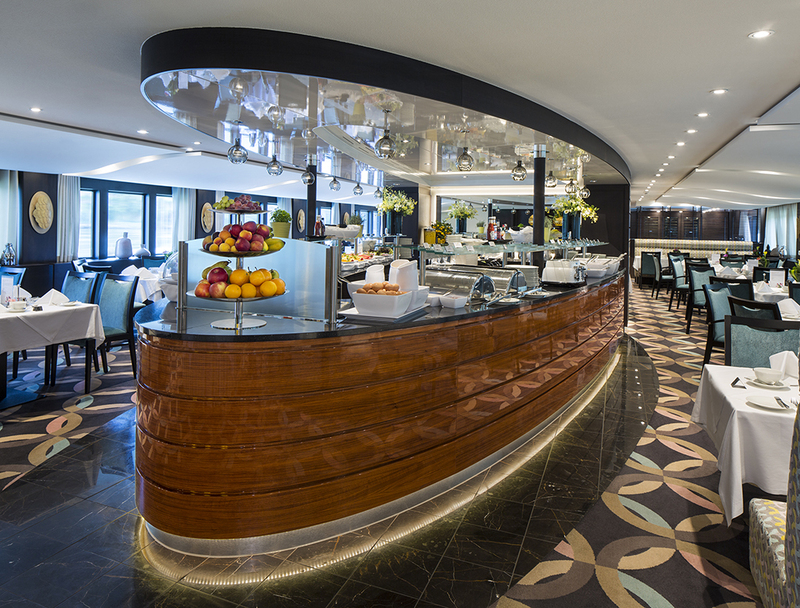 All that activity can build up an appetite and AmaWaterways is the only river cruise line to be inducted as a member of the exclusive Confrérie de la Chaîne des Rôtisseurs, international culinary society. The menus at lunch and dinner include local specialties of the countries we’re visiting, with complimentary free-flowing local beers and wine. A newly added amenity is a daily complimentary “Sip & Sail” cocktail hour, with entertainment and a presentation of what to expect in coming days. One evening aboard features a gala five-course, locally-sourced Chaine gourmet dinner in the restaurant. But each night is an experience of delectable treats served course by course. With the open-seating policy, you can arrange your own dinner parties with fellow guests each night if you wish. There are also two enclosed “wine bars” – restaurants that seat up to 12 which can be reserved for celebratory gatherings. A must-do on any cruise is an evening in the alternative specialty restaurant, The Chef’s Table, with a panorama from the aft of the ship. It features a wine-paired tasting menu with chefs preparing the courses in a glass-enclosed kitchen. It’s a special treat and seating is so limited that guests can make only one reservation on a week’s cruise. Menus at dinners and lunches are filled with local specialties and chefs also offer cooking demonstrations in the lounge at times when we’re sailing. One afternoon it was an apple strudel making demo topped off by a tasting and sparkling wine spritzers. Tapas-sized plates of salads, grilled vegetables or breads and cheeses are also available from the bar throughout the day for those who feel the need for a snack. Something I really appreciate is that every menu item in the restaurants includes a code of ingredients used in the preparation that those who have food allergies might want to know about—everything from nuts to flower petals. Fortunately, I’m not affected, but who knew there are so many potential allergens they fill an entire page at the back of the menu? You’d be hard pressed to climb every mountain here, and frankly you wouldn’t want to try to scale the impossibly steep hillsides that are covered in painterly perfect rows of grape vines. And why scale mountains when the most comfortable place to get the best views is on board a ship on the Danube? As AmaWaterways’ president Rudi Schreiner is fond of reminding guests, the name Ama comes from the Latin word for love. You can easily fall in love with this ship, its crew and this experience. It’s a love that will bring you back for more. Written by: Wallace Immen for Cruise & Travel Lifestyles (2019). 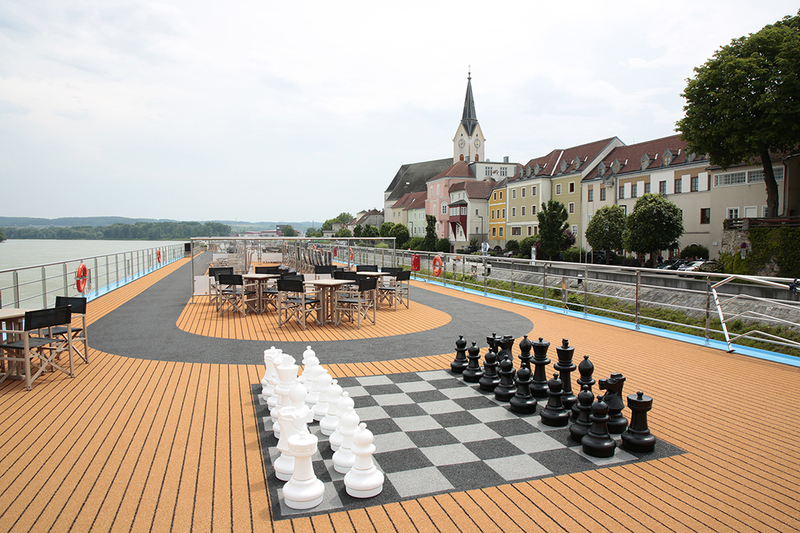 All photos courtesy of AmaWaterways.